Animals being euthanized should not experience pain, fear, or other significant stress prior to their death – that is what is meant by humane euthanasia. Euthanizing animals can also be psychologically difficult for some personnel, particularly if they perform euthanasia repetitively or are emotionally attached to the animals being euthanized. When delegating euthanasia responsibilities, supervisors should be sensitive to this issue. Euthanasia process is not that simple as it may seem and there are also special procedures of euthanasia for each type of Laboratory animals. Carbon dioxide (CO2) is currently considered to be a safe and humane method of euthanasia that has long been the preferred technique for use with rodents (the following types of euthanasia is always UNACCEPTABLE in conscious animals: KCl, MgSO4, strychnine, neuromuscular blocking agents, exsanguination, air embolism, ether, chloroform, carbon monoxide). The gas is inexpensive, nonflammable, and nonexplosive. 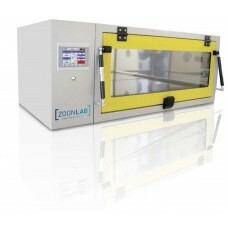 Use of an appropriate chamber allows groups of rodents to be rapidly euthanized simultaneously. It causes no accumulation of exogenous chemical residues in tissues nor does it produce observable histological changes (with the notable exception of pulmonary tissues). Exposure to high concentrations of CO2 has an initial rapid depressant and anesthetic effect, which is followed by death through asphyxiation while the animal is unconscious. Carbon dioxide must be purchased and utilized in compressed gas cylinders. CO2 generated from other sources, such as dry ice or fire extinguishers is unacceptable because gas flow cannot be regulated precisely in those circumstances. Exposing animals to a CO2 concentration of 70% or more can induce unconsciousness very rapidly. However, high concentrations of CO2 can cause a marked bradycardia in rats and mice, presumably via nasal chemoreceptors. Humans perceive CO2 exposure via the nasal mucosa at similar concentrations to be a noxious stimulus, and because rodents show distinct aversion to high concentrations of gas it is assumed that rodents find it distressful. For this reason, the 2013 edition of the American Veterinary Medical Association Guidelines for the Euthanasia of Animals concludes that CO2 euthanasia is humane only when rodents are exposed to a gradually rising concentration that will cause narcosis (loss of consciousness due to the depression of cerebral activity) before the sensitive respiratory tissues are exposed to high concentrations. An optimal flow rate for CO2 euthanasia systems should displace 10%-30% of the chamber (or cage) volume per minute. 1. Ensure that the heart is not beating by feeling the chest between your thumb and forefinger. 2. Ensure that there is no blink reflex by touching the eyeball. 3. If there is a heartbeat or blink reflex, repeat the euthanasia process as described above or use scissors to open the chest cavity to create a pneumothorax (the animal must be non-responsive to a toe pinch prior to performing this procedure). 1. Overcrowding animals in the chamber. 2. Using equipment or methods that cause the animals to be exposed to suboptimal concentrations. 3. Not assuring that animals have been completely killed prior to disposal. 4. CO2 should NOT be used as the sole method of euthanasia in neonatal rodents and fetuses , because the time required for death to occur may be substantially prolonged due to their inherent resistance to hypoxia and hypothermia. Carbon dioxide and CO2 gas mixtures must be supplied in a precisely regulated and purified form without contaminants or adulterants (e.g., from a commercially supplied cylinder or tank). As gas displacement rate is critical to the humane application of CO2, an appropriate pressure-reducing regulator and flow meter must be used. Since carbon dioxide is 50% heavier than air, chambers should be designed so that as they fill with gas they can vent from the top. This allows the air to exit at the top and be completely replaced by carbon dioxide. Incomplete filling of a chamber may permit tall or climbing animals to avoid exposure to an optimal concentration of gas, which can lead to prolonged distress to the animals. The top or walls of the chamber must be transparent so that animals are visible and observed during euthanasia. Euthanasia is a procedure that must be performed humanely.